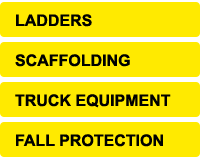 House of Ladders offers a wide range of fall protection brackets and guardrails for your protection needs. Whether you are looking for a specific configuration or you need help setting one up, we've got you covered. For a complete list of fall protection equipment and supplies, please browse our online product catalog below. Can't find what you are looking for? Give us a call at (800) 334-6909. You can browse our extensive line of fall protection equipment and supplies utilizing the category links below. Please use our convenient product filter search to sort your fall protection supplies by material and load capacity. Looking for more than brackets and guardrails? Click here to view our the categories of products we have available for you. We carry a wide variety of items and if you don't see what you are looking for, we can gladly locate it for you. Our trained professionals and knowledgeable sales force are available to answer any questions and can be reached at (800) 334-6909. We are committed to offering our customers the highest quality equipment available at the best price. The Acro Fixed Roof Bracket can be used with various pitches and plank sizes. Provides easy installation and removal without damaging shingles. The 10410 End Fence Guardrail is used to prevent workers from walking of scaffold and ensure their safety. Adjustable angle guardrail system perfect for flat roofs.Fits most roof pitches and made for easy install and removal with the basic of tools. Acro’s proven 12070 Steep-pitch Guardrail Brackets along the eave-edges from 4/12 to 16/12.A continuous guardrail around the entire roof edge. This innovative full guardrail system is easy to install. Use Acro’s exclusive 12075 Open-edge Guardrail Brackets on rake-edges of any pitch,installs and removes like roof brackets.easy installment perfect for fo your needs.Can be used in all phases of construction.Can be used in conjunction with 12070 Residential Guardrail system to form an ideal all around guardrail system.Made in America. Guardrail for steep pitches with roof bracket and holders that can be used in all phases of construction.Has an updated design for greater strength.Installs quickly and is easily Slotted for easy removal. The Acro 12045 Vertical Guard Rail base bracket and post is for low pitch roof, masonry and parapet walls. This unique system is designed to be anchored on the outside of a parapet wall so that work can be done to the decking and cap without interference from the fall protection system. This wall scaffold bracket is convenient and easy to use the suits the needs of residential or commercial roofing projects in order to create a safe walkway.This product is made for quick installation.